General Tso’s chicken is one of my favourite orders when I’m at a Chinese restaurant, in addition to Kung Pao Chicken (I’ve a lot of favourites in Chinese cuisine 🙂 ). The name sounds like its recipe passed on by generations of an ancient dynasty in China. However, that’s not the story. 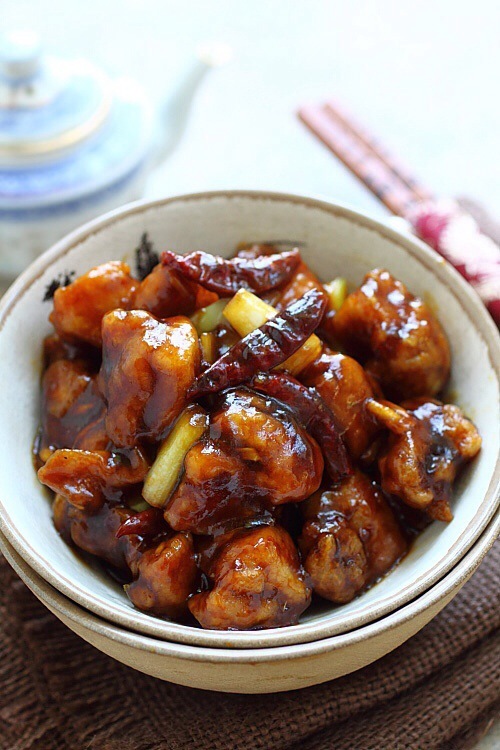 General Tso’s chicken is known to introduced or created by New York-based Taiwanese chefs. Well, whatever the history maybe, the present is extremely delicious. General Tso’s chicken is sweet and mildly spiced. The most important ingredient to me is the rice vinegar. Its sweeter, milder, and less acidic – perfectly adds to this Chinese recipe’s delicate flavours. Let’s take a look. 1. Coat the chicken generously with the 1/3 cup cornstarch. Deep fry the chicken until they turn light brown. Dish out with a strainer, on kitchen napkins to drain the excess oil. 2. Mix all the sauce ingredients in a bowl and keep aside. 3. Heat up a wok with 1 1/2 tablespoons oil. Add the minced ginger, garlic, and dried chilies into the wok. Stir-fry for a minute or two. Be careful, the aroma is going to be spicy. 4. Pour the sauce into the wok. When the sauce boils and thickens, add the chicken. Stir to combine well with the sauce. Add the spring onions. Toss for a minute on high flame. Ready to plate. Serve. Enjoy.